KANSAS CITY, Mo. — A Jackson County sheriff's deputy made a surprising discovery while serving an eviction notice at a southeast Kansas City home on Wednesday. Kansas City Animal Control officers called Dana Savorelli with Monkey Island Rescue in Greenwood, Missouri, to help wrangle the alligator from a tub inside the home. "With the water, he was in about 18 inches deep, but he could get up and get out and cruise through the house. He had a ramp," Savorelli said. It took four officers to haul the alligator out of the house. "We put a snare pole around his neck and got them up to where I could get his mouth shut safely and he rolled a little bit which was good — let him roll as much as he can, wear him out," Savorelli said. The alligator was taken to Monkey Island Rescue. Animal Control took the three snakes and the rabbit to KC Pet Project. Casey will not be able to get the alligator back. 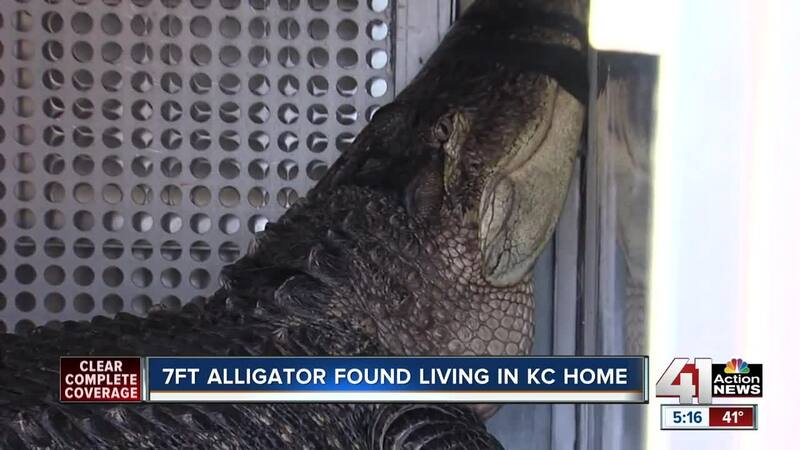 "He can reclaim the snakes and the rabbit, but the alligators are a prohibited animal here in Kansas City, so he won’t be allowed to retrieve that animal," said James Donovan, a KCMO Animal Control special investigator. Donovan said this was his second or third alligator call in 15 years, but "the first one of this magnitude and size." Casey told 41 Action News that when he first got the reptile, he kept it in an aquarium. But the gator quickly outgrew that space. "I’ve had him since he was itty-bitty," Casey said. Katfish's diet of chicken nuggets, steak, deer, fish and rats got him to his current weight of more than 200 pounds. "It's not a vicious animal like some people may make them out to be," Casey said. Casey will get a ticket for possessing an exotic animal within city limits. Editor's note: An earlier version of this story misspelled the alligator's name. Its name is Katfish, not Catfish. The story also described the reptile as 6 feet long. Officials later clarified that it is 7 feet long and weighs more than 200 pounds.